Fracture-dislocation of the thoracic or lumbar spine caused by high-energy trauma often results in severe neurologic deficits when dislocation is significant. 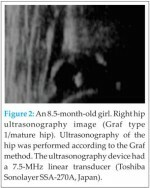 However, cases of fracture-dislocation of the thoracic or lumbar spine without neurologic deficits are rarely reported in the literature, [1-5] and the treatment options for these cases remain controversial, with previous reports advocating either operative or conservative treatment [1, 5, 6]. Here we report two cases of significant fracture-dislocation of the thoracic or lumbar spine without neurologic deficits that were successfully treated surgically. Case 1 A 27-year-old woman was injured in a motor vehicle accident. She had back pain with no neurologic deficit. Neurological examination found no abnormalities. No associated injury was detected. Plain radiographs of the thoracic spine revealed fracture and anterolateral dislocation of T7 and T8 vertebrae (Fig. 1A and 1B). Axial views of thoracolumbar computed tomographic scans showed an intact spinal canal with fracture of the pedicles (Fig. 1C). Three-dimensional reconstruction confirmed fracture and lateral dislocation of T7 and T8 vertebrae (Fig. 1D). Closed reduction was not attempted. Laminectomy followed by subtotal corpectomy and anterior reconstruction using a Kaneda device in the lateral decubitus position was undertaken 9 days after injury. Postoperatively, the patient was neurologically intact and radiographs showed almost normal alignment (Fig. 1E and 1F). At 7 months follow-up, the patient had no back pain or paralysis. Case 2 A 35-year-old woman was injured in a motor vehicle accident, and had back pain with slight numbness in both lateral thighs. Neurological examination revealed no motor or sensory abnormalities and there were no associated injuries. Preoperative radiographs of the thoracolumbar spine revealed rotational fracture-dislocation of the L1 and L2 vertebrae (Fig. 2A and 2B). Axial views of computed tomographic scans confirmed rotatory dislocation of the two vertebrae, and the pivot seemed to be in the spinal canal (Fig. 2C). Three-dimensional reconstruction showed the fracture-dislocation clearly (Fig. 2D). Closed reduction was not attempted, and the same surgical procedure undertaken in Case 1 was performed 5 days after injury. No neurological deterioration was noted and postoperative radiographs showed the reconstructed spinal column with mild local kyphosis (Fig. 2E, 2F). The patient had no back pain and was neurologically intact at 11 months follow-up. We present two cases with significant fracture-dislocation of the thoracic or lumbar spine without neurologic deficits. In each case, certain factors were considered crucial to neuropreservation. In the first case, bilateral pedicle fractures at the involved levels preserved the relationship between the spinal canal and the posterior elements; in the second case, rotational displacement and collapse of the broken vertebrae decompressed the dura and widened the spinal canal [1-5]. We believe these factors significantly contributed to the patients’ preserved neurologic function. 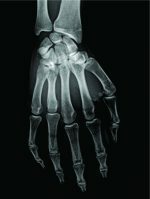 In previous reports, the clinical outcome of patients who were treated conservatively without correcting such abnormal alignment was good in short-term follow up, but the long term outcome of such dislocation has not been reported. Reconstruction of the spinal column is one of the treatment methods to avoid neurological deterioration, late deformity, and pain [1, 5, 6, 7]. In cases of fracture-dislocation of the thoracic or lumbar spine without neurologic deficit, anterior subtotal corpectomy and reconstruction combined with posterior decompression can restore the alignment and stability of the spine [6, 7]. Therefore, we recommend surgical intervention as the first choice for patients with no other injuries. Anterior subtotal corpectomy and reconstruction combined with posterior decompression is a good option for these cases to restore the alignment and the stability of the spinet. 1. Shapiro, S., Abel, T. & Rodgers, R. B. Traumatic thoracic spinal fracture dislocation with minimal or no cord injury. Report of four cases and review of the literature. J Neurosurg. 2002; 96: 333-337. 2. 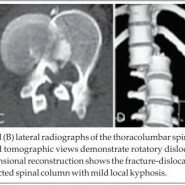 Hsieh, C. T., Chen, G. J., Wu, C. C. & Su, Y. H. Complete fracture-dislocation of the thoracolumbar spine without paraplegia. Am J Emerg Med.2008; 26: 635-637. 3. Hidalgo-Ovejero, A. M., Garcia-Mata, S., Martinez-Lecea, F. J., Goni-Zubiri, I. & Alzueta-Zubiri, L. L3-L4 dislocation without neurological lesions. Bull NYU Hosp Jt Dis. 2010; 68: 60-64. 4. Guzel, A., Belen, D., Tatli, M., Simsek, S. & Guzel, E. Complete L1-L2 lateral dislocation without fracture and neurologic deficit in a child. Pediatr Neurosurg. 2006; 42: 183-186. 5. Miyasaka, Y. et al. Posterior fracture-dislocation of the thoracic spine without neurologic deficit. A case report and short literature review. Spine. 1993; 18: 2351-2354. 6. Gnanenthiran, S. R., Adie S., Harris, I. A. Nonoperative versus operative treatment for thoracolumbar burst fractures without neurologic deficit: a meta-analysis. Clin Orthop Relat Res. 2012; 470 (2):567-577. 7. Verlaan, J. J., Oner, F. C. Operative compared with nonoperative treatment of a thoracolumbar burst fracture without neurological deficit. J Bone Joint Surg Am. 2004;86-A (3): 649-650.